Basketball is a purely American creation, being the one major sport to have its origins completely in the United States rather than being an altered version of a popular sport elsewhere in the world, such as baseball, which is derived from Cricket. A simple game with simple rules but also a team game, which made it ample video game fodder from the earliest days of gaming, from the Atari 2600 to our modern high definition consoles. 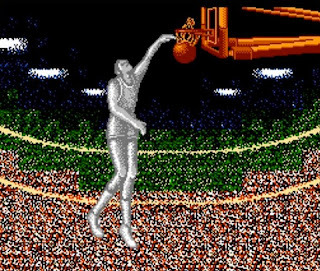 Here we take a look back at the history of basketball video games over the years up to the end of the eight-bit era. Basketball was invented by Dr. James Naismith in 1891 as a winter sport to distract a rowdy class of athletes Dr. Naismith was in charge of at a YMCA in Springfield, Massachusetts. The early games were pretty raw compared to the modern game, with only thirteen rules and a peach basket with a solid bottom serving as the basket. 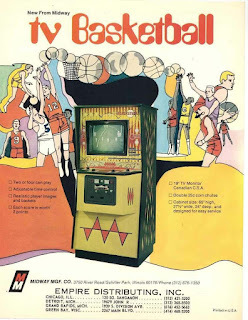 Early video game representations were just as rough around the edges, the first being Taito's Basketball arcade cabinet, renamed TV Basketball for the American market. 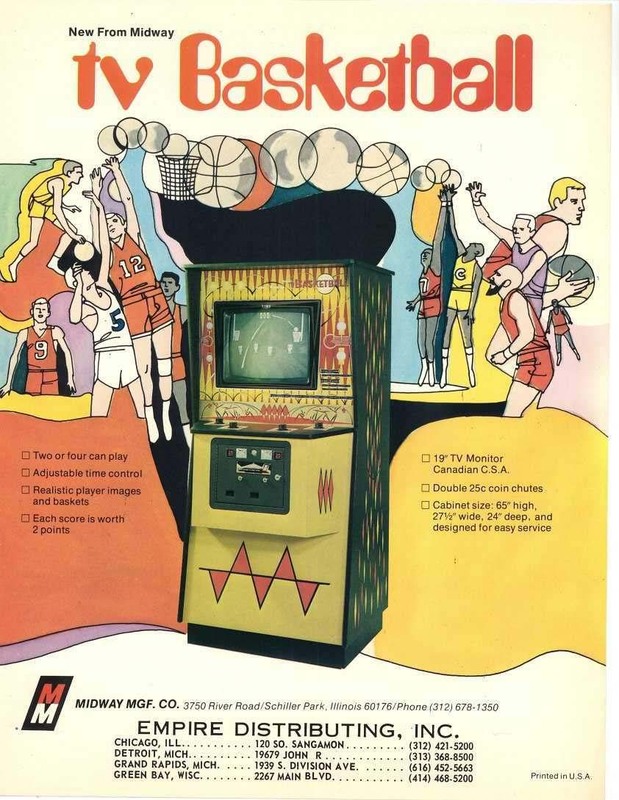 Released in 1974, it shared the stage with many other famous Taito arcade machines of the era and was a two player cabinet with a black and white display and mono sound, a far cry from today's latest 2K and NBA Live entries. Up next is Basketball for the Atari 2600 in 1978, which was also featured briefly in the cult comedy classic Airplane when NBA legend Kareem Abdul Jabaar was seen playing the game during the movie. Unlike Taito's arcade machine this game was in color and the first home console version of the sport, although still enjoyable Atari Basketball is minimal and very dated today, but is still fun to play never the less. The game is on a four-minute time limit to see which of two players on the court can reach the higher score. Movement of the player on the virtual court was very limited by the console technology of the time and the player could only face the basket he was shooting at or his opponent he was defending. If there is one game company that was involved in almost every part of basketball video game history, it is Electronic Arts. Today they are known for the NBA Live series of games, as well as the popular Madden and FIFA franchises, but they also produced the first basketball video games to feature real NBA players in 1983's Dr. J and Larry Bird Go One on One. 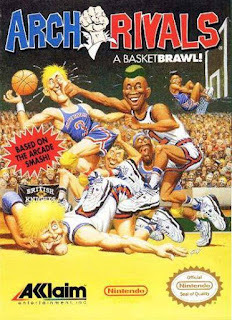 Released across most of the home computer platforms of its generation as well as the Atari 7800 home console this game was the first to make major strides in game play with matches that could be set to a certain score or time limit and plenty of new features like spin moves and blocked shots. It also featured a breakable backboard which would be swept up by an animation of a janitor with a broom and was the first game to feature fouls for aggressive play. A bit later in 1988 a revised version of this game was released featuring Michael Jordan in place of Dr. J and saw releases on such notable platforms as the Nintendo Entertainment System (NES), Commodore 64 and the Sega Genesis. 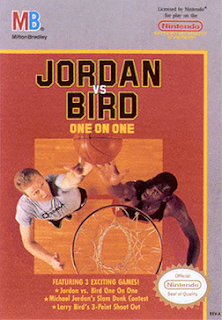 This game also allowed players to join in a slam dunk contest with Jordan or a three-point shoot out with Larry Bird, a first for the genre. Some elements of this style of one-on-one game play would be brought back for EA's NBA Live 2000. 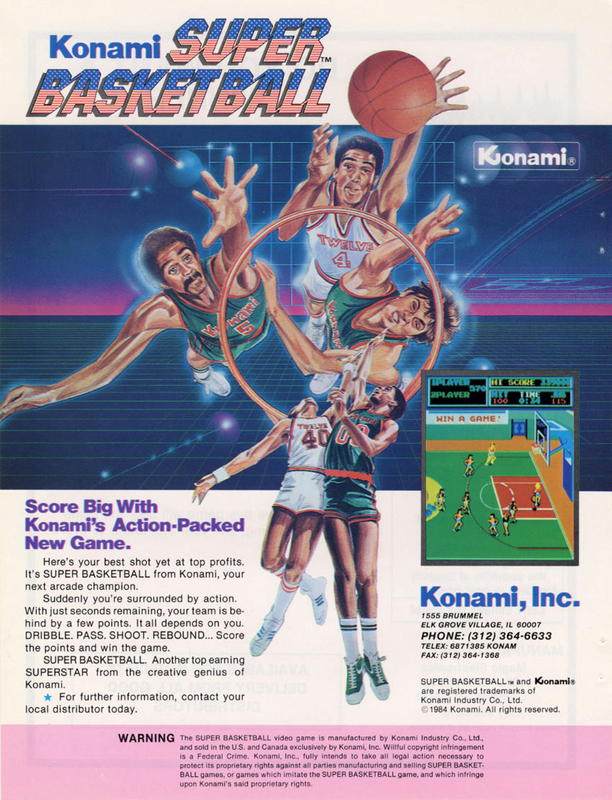 Another big name game company, Konami, tipped off in the basketball genre with Super Basketball, an arcade cabinet produced in 1984. In color and featuring some great graphics for its period, it had a marked difference in the usual game play. Rather than trading baskets for two and three points as in the real sport, the player would have a computer opponent who already held the 'high score,' which it's human opponent had to top before the time ran out. The game also featured some early examples of digitized voice in a video game. 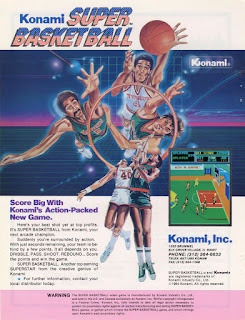 Konami would take what it had learned with Super Basketball and apply it to Double Dribble, which appeared in the arcades in 1986 and then hit the at home market between 1987 and 1990, most notably the NES in 1987 and the Commodore 64 and Amiga computers in 1990. This time the graphics included cut scenes for when you player attempted some slam dunks or jump shots and was among the first video games to use cut scenes during game play. The arcade version also featured the American National Anthem during its attract mode used to draw in players to the cabinet and also used a unique style of paid play. If the human player was losing after a minute of play, another credit was required to continue. However, if the Human player was ahead of its CPU opponent a free minute of play was awarded. Although this game did not have any official connection to the NBA, many of the team names were takes on their real life counterparts, such as the Chicago Ox or the Los Angeles Breakers, a play on the Chicago Bulls and the Los Angeles Lakers, respectively. 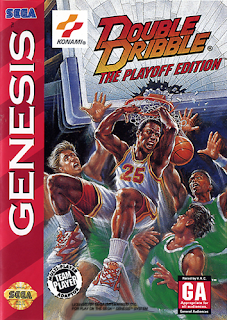 Not forgetting how popular the voice sampling was in Super Basketball two years earlier, Double Dribble also became somewhat fondly remembered for the voice over title screen in which the words “Double Dribble!” was etched into the brains of many arcade goers and NES owners alike. Voices were also used for the jump ball and for fouls. A sequel was released for the Sega Genesis in 1994 titled Double Dribble: Playoff Edition, which had 15 teams instead of the original four, allowed up to eight players as long as you had a multitap peripheral for the Genesis and also featured a tournament mode, a precursor to the later season/playoff modes that would become commonplace. Additionally, a Gameboy version was released in 1991 called Double Dribble: 5 on 5. By this time the NES and video games were so popular the world over that other basketball related titles started to appear on the shelves. The next entry was Magic's Johnson's Fast Break by Arcadia Systems in 1990 (it had also appeared on various computer platforms in 1989). 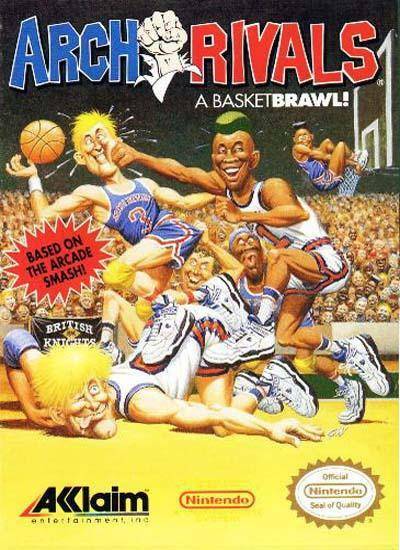 This game pretty much stuck to the same sort of side scrolling game play that had been in place since Super Basketball with the addition of Magic Johnson's smiling mug appearing and giving various forms of text based praise for good play as well as when a foul was called. It featured a four player mode for the NES Four Score and also was the first basketball game to have outside advertising in the game as Pepsi was displayed along the sideline of the court. Despite Magic Johnson's involvement no NBA teams or logos are used. Next up is a game that is still very playable and at the time was a respectable title in both the arcades and the NES, Arch Rivals by Midway. The game itself is great fun and is the first of the more 'arcade' style of play later replicated in Midway's NBA Jam and EA's NBA Street. Funny animation sequences interrupt the action on the court to show coaches fuming on the sideline, a cheerleader rooting for their teams and referees calling fouls. Owners of the arcade version could also alter team and player names to better represent the popular NBA teams and players of the day. 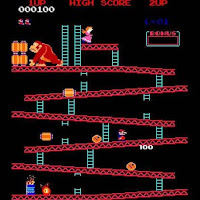 The arcade version featured better graphics than had been seen in many of the games mentioned above but took a step down or two from the port to the NES in 1990, one year after its arcade release. The NES version is not as fun nor as fluent as the arcade version but did take a page from Magic Johnson's Fast Break's playbook when they had an ad for British Knights on the sidelines, a popular brand of athletic shoes at the time. A port was also made to the Sega Genesis in 1992, which had improved graphics and game play but still did not hold up to the visuals and fun of the arcade, which would finally make it to home consoles when it was emulated into three of Midway's arcade compilations on the PlayStation 2, X-Box, PSP, and Gamecube. Like the evolution of the game itself, from a YMCA gym to multi million dollar arenas, basketball video games evolved as the gaming world itself changed with the times and advances in gaming technology. Although they still have not found a way to really capture the smell of sweat and stale popcorn, maybe that is for the best. So that is it for the original basketball video game all stars, find one of these classics, grab a buddy and go shoot some virtual hoops! Of course, basketball video games did not end in the eight-bit era of gaming and next time we will be exploring the sixteen-bit entries in basketball games and follow its progress into the current gaming generation.